Why Is Safe Power Washing So Important In Sugar Land? Being safe is always a good idea and I think everyone knows this. Sometimes certain professions are just more dangerous than others and that’s the way it is – right? Being a professional football player is pretty dangerous, defusing live bombs is pretty dangerous, being a cop while the animals from BLACK LIVES MATTER are on the loose is pretty dangerous. Being a pressure washer…maybe not on that level but it can be a dangerous profession if you don’t take the proper precautions. Most newbies to the industry and probably all homeowners to try to pressure wash on a ladder will quickly realize that it is more dangerous than it seems. The machine puts out a lot of pressure – hence the name! SO when you are up on a ladder suspended 5, 10 or 15 feet in the air and you pull that trigger there are a lot of moving parts and none of them are moving in your favor. First the force of the water is pushing equally against you. If you are in a strong position like you would usually be on the ground this is not usually a major problem but up in the air on a ladder cleaning one of the thousands of 2-story homes in Sugar Land it becomes an issue. For every action there is an equal but opposite reaction and this means you are going to be pushed against by 2500, 3000 or even 4000 psi while hanging on with one hand and possibly one foot. Sound like fun? As professionals we remain on the ground almost all the time with the exception being if there is some strange geometry that keeps is from being able to spray an area…usually this happens when there is a covered porch or a chimney. Not that our equipment can’t spray high or far enough but there is something in out way….like a house. On a day with calm wind our equipment can allow us to clean a 3 story structure from the ground. We have even gone up to 4 stories with a small step ladder. I say all that to say this – if it looks dangerous from the ground imagine how dangerous it looks from 15 feet in the air. Just call the pro’s and let us do it right while you remain safely on the ground! Congratulations on the continued success of your great local business! 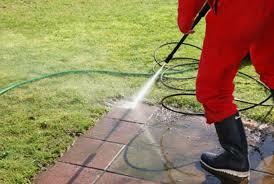 Your pressure washing work in Sugar Land is well-respected. I have seen excellent results firsthand. I too run a local business – one for professional counseling with a Catholic focus – our Sugar Land location is here https://rejoicecounseling.com/sugar-land-tx/. I highly recommend Daniel and his team to anyone looking for any kind of pressure washing work in the Houston area!